For our patients nothing but the best will do! What does Cold Light Laser Do? Stimulates wound healing and tissue repair. Develops collagen and muscle tissue. Relieves acute and chronic pain. What conditions are commonly treated with Cold Laser? Is low laser therapy effective? 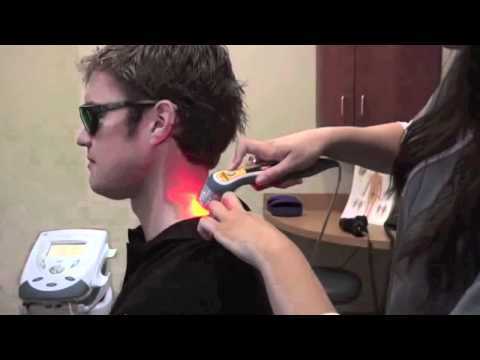 There are studies that show low laser therapy to be very effective in treating certain kinds of conditions. Below is a summary analysis conducted by the Cochraine Collaboration- an independent not for profit group internationally recognized as the benchmark for high quality information about the effectiveness of health care. Their summary ( in this case unspecific lower back pain treatment) clearly shows evidence that LLLT was more effective in reducing pain in the short-term (less than 3 months) and intermediate -term (6 months) than a sham (fake) laser. Though pain reduction was considered small, as with most modalities that "small" reduction in pain may be enough pain relief to allow the patient to participate in therapeutic activities and exercises that have proven to be effective. As with most modalities in physical therapy, rarely will one modality be proven to be effective in isolation, though anecdotally most therapists will agree that certain combinations of therapies can be effective in treating certain conditions. The problem is that further studies are required to determine which types of treatments are effective for which "classification" of symptoms. Most studies today follow the traditional anatomically based medical diagnosis and are non-specific with what should be distinct pathologies identified in these studies based on overall clinical presentation. This makes it difficult to decipher what specific treatments may be effective for which classification of symptoms. Physical therapy is beginning to move away from the anatomically based model and more towards a classification approach that looks at subgroups of populations presenting with specific pain patterns to determine which treatment approach would be most effective. This is the approach our therapists at Brookline Physical Therapy take towards treatment of lower back pain. Does my Insurance cover Cold Laser treatments? Unfortunately because Cold Laser Treatment is still under study and considered "investigational" by most insurance companies the cost is not covered by your insurance. However, if you are receiving physical therapy at Brookline Physical Therapy we will recommend Cold Laser treatment as part of your plan of care and document it accordingly if we believe it will be effective. In most cases we will not charge you an additional fee for cold laser treatment. (similar to the way most clinics do not charge you for hot or cold packs) The only instance we would charge for cold laser treatment is if you or your doctor request cold laser treatment as a stand alone treatment, in which case the cost for the treatment alone is $35 a session. We purchased a cold laser machine for Brookline Physical Therapy because we wanted to offer our patients the best treatment options available in physical therapy today. Yes, the treatment is completely painless and without any known side effects. Low level laser therapy (LLLT) is used by some physiotherapists to treat LBP. LLLT is a non-invasive light source treatment that generates a single wavelength of light. It emits no heat, sound, or vibration. It is also called photobiology or biostimulation. LLLT is believed to affect the function of connective tissue cells (fibroblasts), accelerate connective tissue repair and act as an anti-inflammatory agent. Lasers with different wavelengths, varying from 632 to 904 nm, are used in the treatment of musculoskeletal disorders.